The LEGO DUPLO 10572 All-in-One Box of Fun has a whole load of DUPLO bricks for fun building and rebuilding for creative play. At its heart is a buildable wagon base with rounded edges and wheels that really turn. This comprehensive set also includes 2 opening window elements, a cute dog, and numbered bricks with corresponding decorated bricks to help your child develop their counting skills. There are even extra classic DUPLO bricks for more creative fun. 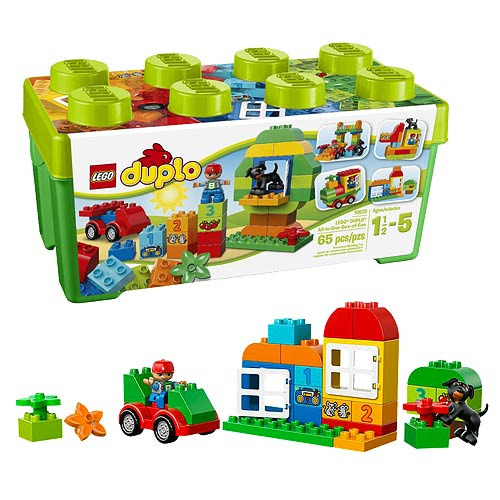 The LEGO DUPLO 10572 All-in-One Box of Fun includes a boy DUPLO figure and 65 pieces with which to build. Ages 1 1/2 to 5. Penny Dreadful Ethan 6-Inch Action Figure - Convention Excl.